Apache Tomcat is an open source web application which is used to deploy JAVA servlets and JSPs. 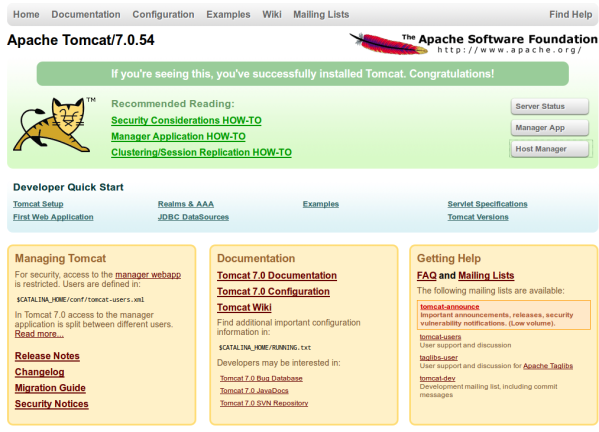 This article helps you to install Tomcat 7 on ubuntu 14.04 . This article contains 2 methods of installation:- Manual and Apt-get. For tomcat 7 latest version , choose manual installation. Using Apt-get method, you will get repository version . 1. Manual installation ( Latest version). Manual installation is highly recommended as you will get latest tomcat version . Step 1 » Install JDK 7 before installing tomcat. Step 3 » Extract the package and move to /usr/local/ folder. Step 4 » Choose username and password to manage tomcat and add to the file /usr/local/apache-tomcat-7.0.54/conf/tomcat-users.xml like the below. The below code must be within < tomcat-users > …. < /tomcat-users > tags. Step 5 » Create a new file tomcat754 in /etc/init.d/ and add the below code. This will create service called tomcat754 . Please change CATALINA_HOME value according to your path. Step 6 » Change the file permission. Step 7 » Now start the service . Step 8 » Now open http://serve-IP:8080 in your browser, you could get the tomcat page like below. you can access admin pages after authentication . That’s it . you got latest version installed. This method is easy, but you will get repository version . Step 2 » Now Install tomcat 7 and other packages using the below command. Step 3 » Choose username and password to manage tomcat and add to /etc/tomcat7/tomcat-users.xml file like the below. Step 4 » Restart the service . Step 5 » Now open http://serve-IP:8080 in your browser, you will get the tomcat repository version. Okay that’s it.. now you will get repository version which is lower than released version . Thanks a lot . especially for the service code. Tasksel is available to install many services. Tasksel is the same tool ubuntu uses when installing a server or alt-installation. I don’t understand step 3 in method 2.